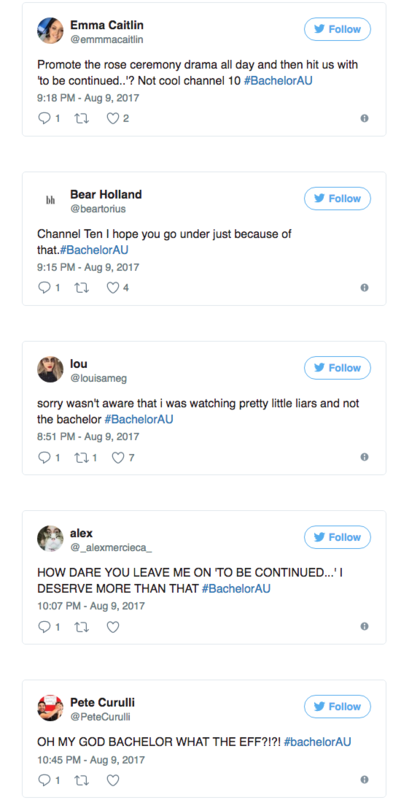 Ten’s The Bachelor is copping some social media hate today after last night’s much-hyped rose ceremony fizzled out to long stares, confused bachelorettes and a “to be continued”. Ten had hyped the episode – watched by 753,000 viewers last night – as Matty J baulking at his rose handing our responsibilities. However, when viewers were informed they had to tune in again tonight to see which poor lady misses out, fans took to social media calling it a “rip off”. It was more favourable news over at Nine after The Block once again took the title for most watched entertainment show of the evening pulling in some 975,000. Nine won a quiet Wednesday night with 28.8 per cent audience share. Seven was second with 25.3 per cent, Ten third with an impressive 20.2 per cent, the ABC had 18.7 per cent and SBS managed seven per cent. The ABC’s Wednesday night of comedy continues to do well with Shaun Micallef’s Made As Hell the ninth most watch show of the evening with 748,000. Utopia managed 721,000 and Hard Quiz pulled 584,000. Seven had the most watched show of the night, its 6pm news bulletin managing 1.07 million. Border Security (671,000) and The Force (629,000) were its other picks.